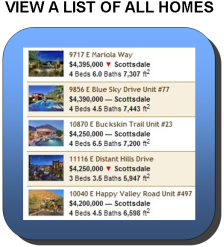 From this page you can easily browse all available Scottsdale homes with a private pool for sale from the Arizona MLS. Our search is updated daily, so you can be confident you are viewing the most current and up-to-date listings on the market. 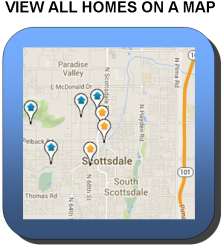 To get started, simply click on one of the buttons below to view a list of all available Scottsdale pool homes, or view homes by location on a map. If you want a home with a pool, buy a home with a pool. While this sounds simple enough, too often buyers make the mistake of purchasing a home, with the intent of adding a pool at a later date. Unfortunately, when the time comes to write the $25,000 - $100,000 check for that resort-style pool you've been dreaming of, the reality of the cost involved sinks in, and suddenly a pool doesn't seem so important. Buying a resale home with a private pool, is similar to buying a used car in some respects. The original owner who had the pool built takes the initial hit with the up-front cost, while the subsequent buyers enjoy the limited value the market will bear for the feature. Most private pools in Scottsdale are not heated. The common exception is when a pool also has a spa, and the plumbing is shared. In this case, usually the spa heater can be used to heat the pool as well. Our swimming pool season in Scottsdale spans roughly from the middle of May through September. The season can be extended by a month or two with the simple addition of a solar cover. For those that wish to swim comfortably in the late fall, winter or early spring, we highly recommend the addition of a heat pump. One of our Scottsdale clients recently had a heat pump and solar cover installed, and is able to maintain a water temperature of 85 degrees on the coldest winter days. In the winter he sees a maximum increase of $200.00 per month on his electric bill. This is a substantial savings compared to the thousand(s) of dollars a month it costs to heat a pool using a traditional gas or electric pool heater. The cost to have a Scottsdale pool company maintain and balance the chemicals in your pool on a weekly basis, averages $80.00 - $120.00 a month. This option is particularly attractive to part-time residents and "snowbirds." In Scottsdale, homes with a private pool account for roughly 41% of all single family home sales. If you do ultimately decide to buy a Scottsdale home with a pool, have your Realtor negotiate for the seller to purchase a one year home warranty on your behalf, with optional pool coverage. While the cost and coverage of home warranties differ, a good policy in Arizona can be purchased for approximately $550.00 - $600.00.